Blog Why Did We Choose Chattanooga For Our Dental Practice? Why Did We Choose Chattanooga For Our Dental Practice? This is a question I think everyone that lives in the greater Chattanooga area gets from time to time. People ask “What brought you to Chattanooga?” or you hear when you are away from Chattanooga “Why do you live in Chattanooga?”. These are good questions, and they are fun to answer. It seems many people choose where they live for so many varying reasons. Top among these reasons is they live where they live because of family ties. Probably a close second to the family as the reason is you live there because of a job. Both of these are great reasons, but we thought it would be fun to take a trip down memory lane and show why Dr. Mark McOmie and Dr. Ellen McOmie live in Chattanooga. It seems incredible they have been here for 20 years because it seems like just yesterday they moved down here from Louisville, Kentucky. We are getting ahead of ourselves, more about how we came to Chattanooga in a minute. Chattanooga today with the Market Street Bridge (or John Ross Bridge) spanning the Tennessee River and the Tennessee Aquarium in the background. Chattanooga is a wonderful place to live. Back in 1998, Chattanooga was not what it is today. Back then the Tennessee Aquarium was new to downtown. Downtown was still sketchy, Big River Restaurant had moved in and was about the only place to eat on the south side of the river. Frazier Avenue was still full of businesses that had bars on the windows to repel thieves. Many of the storefronts were vacant, and the area turned from bad to worse once you crossed Market street. Aside from right around the immediate area of the Aquarium, you didn’t want to be downtown at night or during the day. Coolidge park had just been built and seemed very nice, but it was surrounded by not so nice neighborhood and business storefronts that were boarded up. Dr. Ellen McOmie is from Chattanooga. Her family had business interests here long before she was a Chattanooga dentist. She wanted to come back to Chattanooga to practice her entire life. In fact, she always wanted to be a dentist. When she was a young child she found dentistry to be fascinating she loved to learn about what they did at the dentist office. When she would go to the dentist, she would try to learn everything she could about what they were doing and why. She especially loved when she got braces! She would go home and spend time looking in the mirror at her teeth figuring out what each and every thing did and how it did it. Teeth she learned had a lot going on, they were complex and could be manipulated to look really good and function well. Around the time of WWII Dr. Ellen Standefer McOmie’s grandfather, Charlie B. Standefer had a Gulf service station in East Chattanooga. It was a service station, not a gas station. Back in those days, you went to a service station to have service, one of the services was pumping gas. They could also fix your car, change the car’s oil, fix a flat tire, change windshield wipers, clean the windows, etc. This was the first place Ellen’s father Charles A. (Buz) Standefer worked. Dr. Ellen’s father started working at the service station after school and on the weekends. The Standefers were a well-known family in East Chattanooga. Soon Buz and his father Charlie started selling cars. By the late 60’s they were doing more business selling cars then they were at the service station. 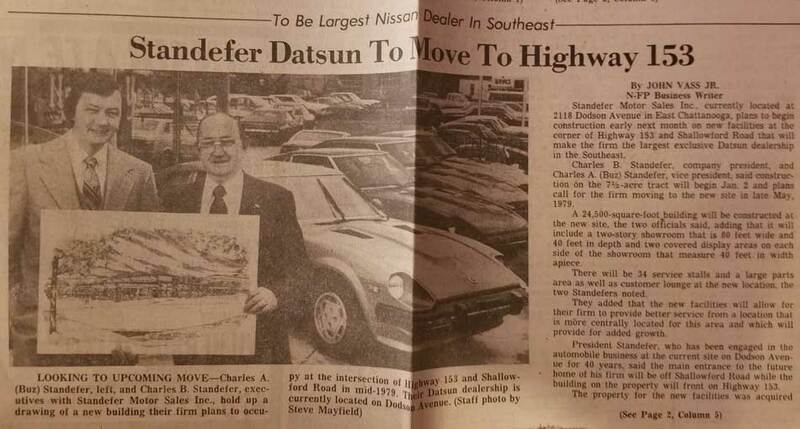 In the 1970’s they were awarded a Datsun new car dealership. The timing was perfect for those small, dependable cars with great gas mileage. The energy crisis of the 1970’s started soon after they got the new Datsun store. It turned out they had the right car at the right time. America loved and embraced these cars with excellent gas mileage from Japan. 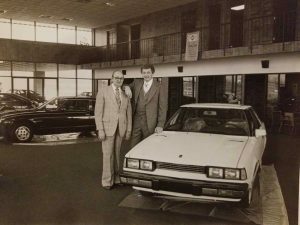 The Datsun dealership took off, but with the success, they began to grow out of their East Chattanooga home on Dodson Avenue across from Hardy Elementary School. Moving the dealership was inevitable. 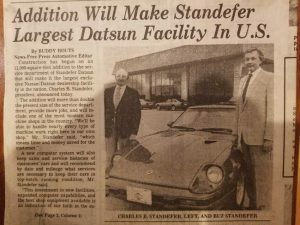 The Standefer Datsun dealership was busting at the seams, unable to keep even a months inventory of new cars on the ground. Service needed more than just a few service bays. Expansion was the only way. Dr. Ellen’s father Buz and her grandfather Charlie went out looking for an area to expand. There was a farm adjacent to Hwy 153 and just off Shallowford Rd owned by the Chapman family. They purchased a large tract with frontage on Hwy 153 and cut in the road to their land. The road is now called Chapman Rd. People laughed and said the Standefer’s had mad a mistake they were too far from downtown to make it. They built the largest Datsun dealership in the nation at that time. Their business exploded soon every car dealer wanted to be on Chapman Rd. Today Chapman Rd houses almost every car dealership in the city of Chattanooga. It is the premier location to be for cars, which was all started by Dr. Ellen’s father and grandfather. In 1996 Buz Standefer who is Dr. Ellen’s father sold Standefer Nissan to United Auto Group. This was the start of an emerging trend in the world of car dealerships. Family owned and operated dealerships selling to large corporations. He then retired from the car business and went on to other ventures. Dr. Ellen and her brother Alan cutting the ribbon at the grand opening of the new location. In 1998 Dr. Mark and Ellen had finished dental school, they were young, eager dentists. They wanted to practice together and make a state of the art dental practice and do things in a fun and quality way. They looked around the country. Dr. Mark McOmie is from Utah, and they looked at opportunities there. Dr. Ellen is from Chattanooga, so they looked at opportunities here. They decided the best thing they could do is to start a practice from the ground up. They would have the advantages of all state of the art equipment from the start; everything would be new and built specifically for a dental office. This is what our Chattanooga dental office looked like in 1997 one year prior to Dr. Mark and Dr. Ellen McOmie acquiring the building. They found the building on the corner of Hwy 153 and Shallowford Rd. It was in a great location and could be made into a dental office. 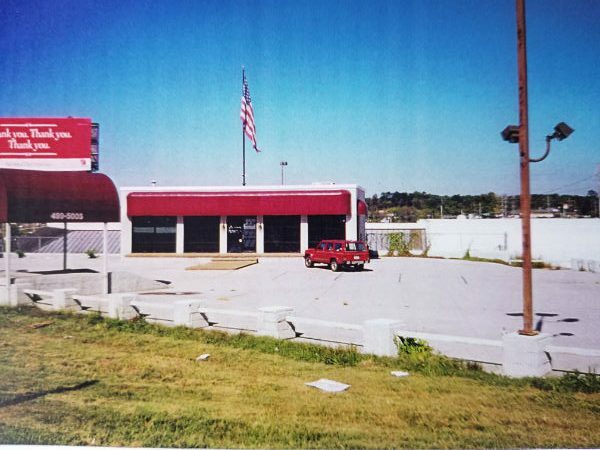 The building had a history of housing car lots. Prestige Auto and Heritage Auto outlet owned by Dr. Ellen’s brother Alan was the last tenant. Dr. Ellen’s father bought the building as an investment, and it was sitting vacant. They made a deal for the lease and began building out what would become McOmie Family Dentistry in Chattanooga, Tennessee. There was one computer back in 1998, and it was at the front desk of our dental office. It was considered modern to have the ability to do all things dental with our computer. Today the office has 15 computers it seems funny to think of how we ever operated with just one computer. One of our first ads. Look at those two young dentists. The first few years started out with three chairs in that office and after a year or so the doctors added a 4th chair. Things were going well, and the dental practice was really growing. 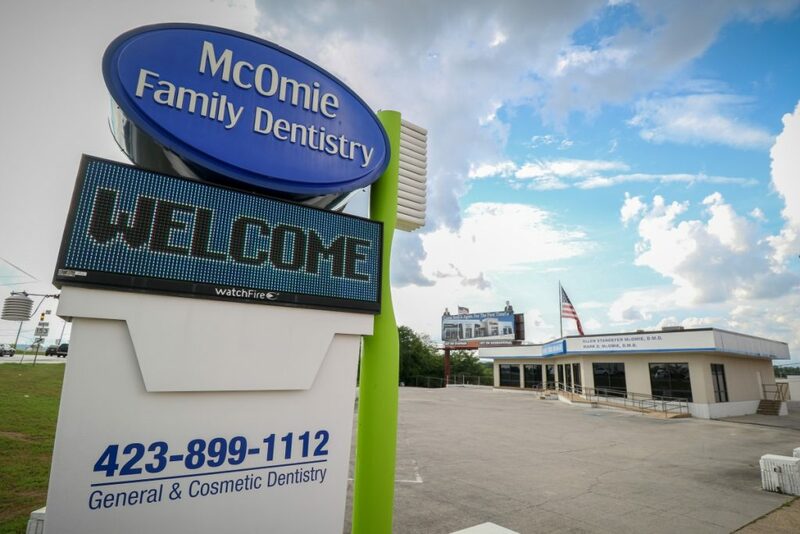 By the 2nd year, it was obvious that McOmie Family dentistry was going to outgrow it’s home. Back then Dr. Mark and Dr. Ellen McOmie frequently did teeth cleanings! Some of our older patients remember those days. At the end of the 2nd year, plans were made to expand at the current location instead of finding a new larger location. In 2001 they broke ground on an expansion that more than doubled the space of our Chattanooga dental practice. It was a tremendous undertaking they took off the side of the building while we were still seeing patients. After what seemed like a long few months the office more than doubled in size. This gave us the ability to see more patients and do more procedures. Both dentists could work at full capacity at the same time in the same location. McOmie Family Dentistry’s Chattanooga dental office on the corner of Highway 153 and Shallowford Rd. what it looks like current day 2018. Our dental office in Chattanooga is much more than just a building. It is a part of the community; it is the patients that come here, the people who work here and much more. The commitment to the Chattanooga community is one of several generations. McOmie Family Dentistry was founded on principles that are long-term relationships with those we serve. We are not from a corporation sent to the community to extract money and send it to a headquarters in a remote city. We are here, and our dental office is part of the community our people are all local, and we are part of Chattanooga. We want long-term relationships with our patients, and we want to take care of the people who come into our practice not just do a few procedures and send them on. We are committed to quality dental work that looks as if it grew there, simply put we want to be the best dentist in Chattanooga. Another view our Chattanooga dental office. You can see the old car canopy ramp that was front and center in our parking lot. Our flag pole is a true landmark in this area to this day. 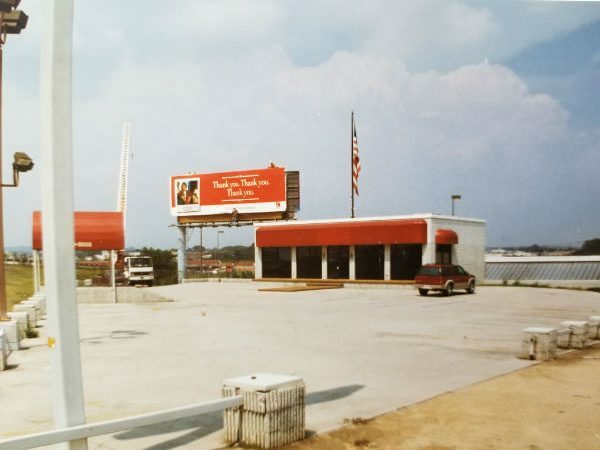 The white pole in the left foreground is now our famous sign with the 14-foot tall green toothbrush. We have been here for 20 years now. Here at McOmie Family Dentistry, we have built a genuine reputation for quality and values. We have been around long enough now that the children who were in our practice back when we started are now bringing in their kids. That is the ultimate honor we feel when we get to see the next generation of patients. We have done literally thousands of cases of veneers, many more root canals, thousands and thousands of crowns. In this time we have done hundreds of cosmetic dental cases. We have learned a lot. We have become material experts; we have constantly evolved and changed as we have found better ways to do things. When we find a way to do things better it almost always makes the dentistry we do easier for the patient. Making things faster, more efficient, easier and better are the goals we strive to achieve. Dentistry is at the intersection of science, art, and technology. If we employ all three effectively, we can do amazing things. Our goal from the beginning back in 1998 was to be the best dentist in Chattanooga, if not the world. We had added procedures and technology constantly, developing a state of the art facility doing beautiful and lasting dentistry. We set out goals to make root canals better, doing them efficiently making it more comfortable for the patient. We wanted to offer our patient implants, in a way that makes things easier, simpler and better. Implants used to be something that took months and multiple visits to many offices to complete. Now we can do the implant and the crown on the implant in as little as two visits and two weeks! The implant alone at most offices takes 3-4 visits and the crown another 2-4 visits and up to six months in time. This is a bunch of driving around town and time away from work and family. Not to mention expense, we can keep the expense to a minimum as well. Doing things in house like this makes things better and more efficient. Cosmetic dentistry has come such a long way as well. We have seen the amount of cosmetic dentistry skyrocket in our time as dentists. We have watched the materials change. The materials have become more beautiful and lifelike, and the most amazing part is stronger. We never thought cosmetic dentistry would have advanced so far in the last 20 years. In the last five years alone the increase has been exponential. With thousands of cases on file most of which have been photographed, we love to show people our work. Yes, we love Chattanooga, and it is an honor and a privilege that a person would choose us to take care of their family’s dental needs. We have never forgotten that. Chattanooga is a great city that is big enough to have things that add to our lives such as shopping and good restaurants, but it is small enough not to have high crime and heavy traffic. We are fortunate to be a Chattanooga dentist with a great practice that is thriving. It seems when you take care of people with great service they respond and keep coming back. We want people to come not for one visit to our Chattanooga dental office but keep coming back using us as their dentist for their entire life. We have had the honor of watching kids grow up have families of their own; we consider it an honor that they came as children then bring their children to us. 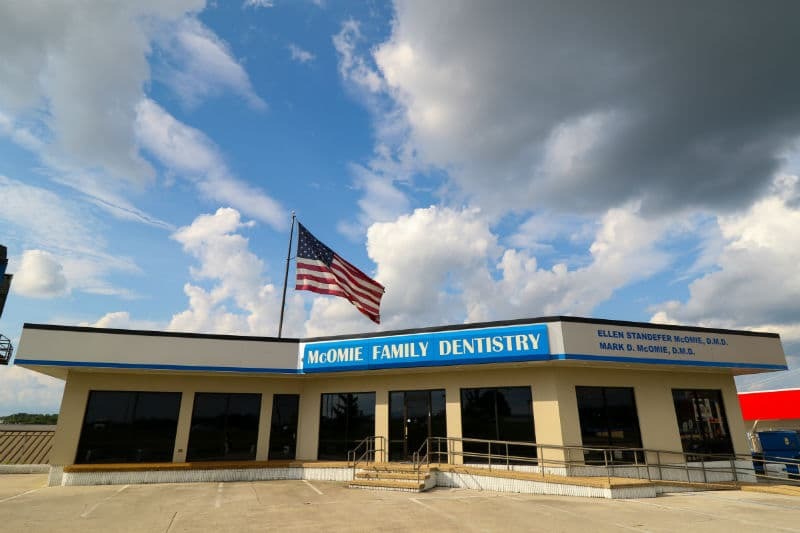 What does the future hold for McOmie Family Dentistry? Both Dr. Mark McOmie and Dr. Ellen McOmie love Chattanooga! Chattanooga is a wonderful place to be a dentist. Our patients are more like family and good friends then just people we see. We are committed to being here another 20 years and beyond. We continue to invest in our practice our technology and our staff. We see dentistry having a bright future we will continue to strive to be the best in the world. Dental technology is helping us make things simpler and more comfortable for our patients all while controlling the costs of dentistry. We don’t think dentistry should cost an arm and a leg, affordable dentistry that is high quality is obtainable. We will continue to offer a range of services from implants, cosmetic dentistry, root canals, crowns, tooth colored fillings. It is interesting for us to note that what we once considered cosmetic dentistry we now consider just dentistry. You see from our point of view ALL dentistry is cosmetic dentistry. Every single restoration whether a filling or a veneer should look as if it grew where it is. There is no reason we should have to see the dentistry that is done. The future is bright for McOmie Family Dentistry we look forward to serving Chattanooga another 20 years! Hopefully, you have enjoyed this walk down memory lane. We love being a Chattanooga dentist. We love the community here and the city of Chattanooga is a great place to live and raise a family. We are happy we are able to be dentists in a town like Chattanooga. It is truly a great place to live. We hope that like us you love living in Chattanooga and enjoy our scenic city. Give us a call we are the best dental office in Chattanooga for a reason, and that reason is our patients. We love every one of you. McOmie Family Dentistry 423-899-1112.